EMDR – Counselling, Psychotherapy, EMDR & CBT Therapy (trauma + anxiety therapy). Clinical Supervision. I am a qualified EMDR therapist and since February 2017 have been successfully working using EMDR to work with clients experiencing trauma (both childhood trauma and adult trauma), depression, anxiety, pain, phobias and panic disorder. The use of EMDR has been recommended by the Department of Health’s National Institute of Health and Clinical Excellence (NICE) in the guidelines they issued on Post Traumatic Stress Disorder in 2005. This reflects the evidence for its effectiveness which has been collected from clinicians and researchers. EMDR stands for ‘Eye Movement Desensitisation and Reprocessing’ and is a therapeutic approach with the goal of reducing distress in the shortest period of time. EMDR is the treatment of choice and is recommended by the National Institute for Health and Clinical Excellence (NICE) for Post-Traumatic Stress (PTSD). EMDR works towards helping you to put frightening, painful, tragic, or humiliating experiences behind you whether they are recent or past experiences. What issues do EMDR therapists work with? When a person is involved in a distressing event, they may feel overwhelmed and their brain may be unable to process the information like a normal memory. The distressing memory seems to become frozen or locked on a neurological level. When a person recalls a distressing memory, the person can re-experience what they saw, heard, smelt, tasted or felt, which can be intense. Processing involves you doing repeated sets of bilateral stimulation (BLS) these are eye movements, tactile stimulation or auditory stimulation, each lasting about 30 seconds. This stimulates the frozen or locked information processing system. The result is that you will make the associations and neural connections needed to integrate, or digest, the disturbing memory. It’s a bit like defragmenting your computer or updating your software. During the process, the distressing memories seem to lose their intensity so that the memories are less distressing and seem more like ‘ordinary’ memories. I work using EMDR holistically, basically this means that it is more than just about stimulating your brain. There are various phases before we reach the processing stage. Stage 1: history taking – where I try to really understand what’s been going on for you and how you are currently being affected. Stage 2: Preparation – this stage involves me teaching you something about the brain, body and trauma. Also we work on relaxation and grounding and coping techniques. We may also do something called resourcing which is aimed at helping you to access more positive experiences, thoughts, and images before moving on through the remaining EMDR phases. Stage 3: Assessment – this is basically assessing what we are going to work on (the target memory) examining images, thoughts, feelings and bodily sensations connected with that memory. Stage 4: Desensitisation – this is the stage where the bilateral stimulation (BLS) comes into play. All of your senses become involved as you process the disturbance you are targeting. After each set of BLS we check in but don’t analyse what’s going on. This is where your brain is working to defragment/unlock those frozen memories. Using state of the art equipment which includes a lightbar, pulsators, and headphone during this phase helps me to carry out the BLS using different stimuli in a professional and standardised manner. 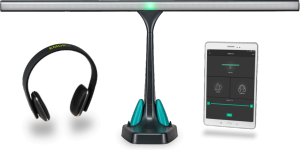 The lightbar, pulsators and headphone can be used together or separately, depending on what you prefer. Stage 5: Installation – we will work to install some positive thoughts around the situation. Stage 6: body scan – this is about checking your body for any residual sensations related to the memory. Stage 7: Closure – The end of the session will depend on if we completed up to stage 6 or if we were still processing a memory we would explore to find a holding space often called a container to contain any distressing material that might come up between sessions. Stage 8: Reevaluation – At the beginning your next session we would reevaluate your disturbance level regarding the target from the last session and see where we go from here, or if in the last session the work had been incomplete we resume at stage four. Distressing events can leave you feeling overwhelmed and your brain may be unable to process what has happened and store it in the same way as a standard event. Thus the distressing memory becomes frozen on a neurological level. When you recall the distressing memory you might feel that you are actually experiencing it all over again and this can be very intense. Sometimes people just try to avoid thinking about the distressing event so that they can avoid experiencing these feelings. Often there is a trigger that sets off the distressing memory and re-experiencing, or sometimes it can just hit you, or pop into your mind. Part of the reprocessing of memories in EMDR is based on eye movements or taps in a left-right stimulation of the brain which seems to stimulate the frozen or blocked information processing systems. The eye movements replicate REM (Rapid Eye Movement) that occurs naturally when we sleep. 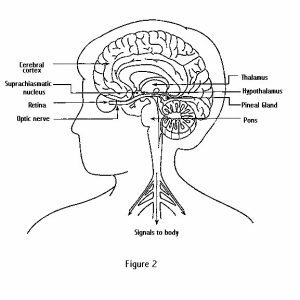 REM sleep begins with signals from an area at the base of the brain called the pons. These signals travel to a brain region called the thalamus, which relays them to the cerebral cortex – the outer layer of the brain that is responsible for learning, thinking, and organising information. Thus EMDR therapy aims to replicate REM in order to learn, think and organise information around the distressing event/memory and store it in a different, more manageable way.